Home BUSINESS NEWS Armyworm invasion threatening farmers with possible crop failure. Armyworm invasion threatening farmers with possible crop failure. Some of the devastation meted by these deadly army worms. (INSET) Stranded farmers trying to control the pest using pesticides. 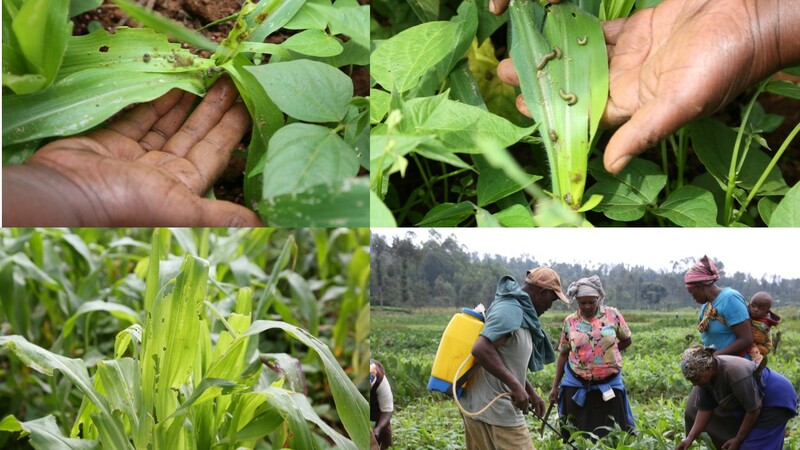 A plague of crop-destroying army worm caterpillars are causing great panic to farmers in Kangema and Maragua constituencies of Murang’a County who are now staring at possible total crop failure. Speaking to journalists, the famers lamented that their attempts to spray three different pesticides to kill the worms have been in vain. Evanson Irungu has consequently appealed to the government to step in and provide accurate pesticide that will help eliminate the worms. “If nothing is done, we will lose up our maize crop. We need the government to help us acquire the right pesticides to eradicate these pests,” said Irungu. He noted that Kangema constituency had never been a victim of such invasion but going by the invasion, its residents might suffer from starvation in the next few months’ time. John Mwangi Ngurumo also a farmer along the Mukungai River lamented that the worms had proved stubborn to three different pesticides that the farmers have used. “These pests have developed resistant to most of the insecticides that are used. The threat is real and huge considering the fact that they are attacking maize which is our staple food. The loss is devastating because are feeding on the leaves of the plant as well as its reproductive parts including flowers, silk and maize cob itself,” he said. Mwangi Irungu narrated how his visits to the area agricultural officer in Kangema town had yielded to no fruits as nothing positive has been forthcoming. He felt irked by the worms saying they are increasing as days goes by and have now invade most of the crops. The complaints were similar to those of Agnes Wanjiru who complained of all her efforts going down the drain even after she planted and put in necessary farm inputs only for her not to harvest anything due to the worms’ invasion. Most of the areas that are affected by the worms are Kangema and Sabasaba area of Maragua constituency.